The "Rockhouse on Burrard Street". This site is not affilliated with radio station CKWX 1130. To go there click here. CKWX is known today as all-news station. But it was Vancouver's first station to adopt the "Top Forty" format back in 1958, giving Vancouver its first weekly hit parade. The lineup of DJs included Red Robinson, who joined the station during the latter part of 1957 (having been brought over from CJOR). It was during this era that Red Robinson brought Elvis to Vancouver. 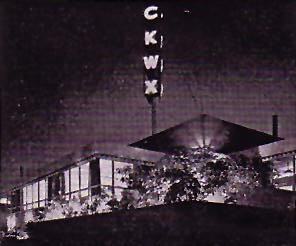 CKWX was dominant in the Top Forty format for several years, even after Red's departure for Portland, Ore. in 1959. Their hit parade was known as the "SENSATIONAL SIXTY" until November of 1960 when it became the "FABULOUS FORTY". In early 1961 Red Robinson returned to the station following his two-year stint in Portland, Ore. Competition with upstart C-FUN was keen. In addition to Red, WX's lineup included the horn-honking Buddy Clyde, Del Erickson, and an early morning show hosted by Steve Woodman and Keith Rich. CKWX was a comparatively large operation which included a large news and sports department. The station regularly carried the Vancouver Mounties baseball games and WHL Hockey Vancouver Canucks, both for which the legendary Jim Robson did the play-by-play. The constant preemption of regular programming was perplexing to the station's DJs, especially Red Robinson. By the Fall of 1961 a gradual change came over CKWX. 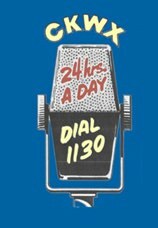 The station introduced a new morning talk show hosted by Barrie Clark, Vancouver's first "open line" show. This was followed by a gradual drift from Rock/Pop over to Middle-of-the-Road music. The once nicely printed FAB FORTY was now being typed out on an office typewriter and mimeographed on standard colored paper, presumably to cut costs. By early 1962 Red Robinson was the only DJ at the station still playing the Rock/Pop format on his nightly Platter Party show. The last FABULOUS FORTY was issued for the week of March 3, 1962, effectively ending the era of CKWX as a Top Forty station. Red left the station shortly after and went to CFUN, starting there April 2.